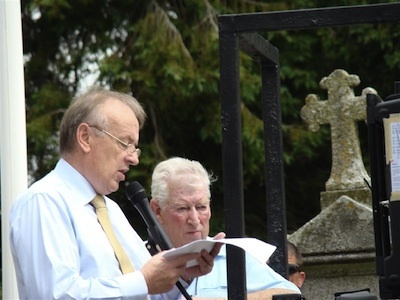 Francie Mackey, Chairperson of the 32 County Sovereignty Movement, delivered the main address at the organisation’s annual gathering at the grave of Wolfe Tone in Bodenstown recently. The following is a copy of his address. The great events in republican history, and the great republican leaders who brought them to pass, share in common a clarity of purpose which was to become the political dynamic behind them. With the onset of the Centenary of 1916 fast approaching there is an almost panicked energy being devoted to muddy the waters of our history to justify the current constitutional status quo. Almost daily in the establishment media on both sides of the border a relentless revisionism continues because they fear the spotlight of 2016 will expose their utter failure in delivering the national rights of the Irish people. The Rebellion of 1798 was an armed expression of Irish Sovereignty. Wolfe Tone perceptively argued that only in an independent sovereign Ireland could the social ideal of uniting Protestant, Catholic and Dissenter be realised. The recognition that complete separatism from the foreign power was the only way that the people of Ireland could resolve those differences, carefully fostered by that foreign power, was the clarity which draws Irishmen and women to this place annually. But standing here is a right that must be earned. It’s not enough to lay claim to the legacy of Wolfe Tone without bringing our own clarity for the Irish people today. The trajectory of the republican legacy is not defined by the pike or the gun but by the political ideas that champion the cause of Irish sovereignty and self-determination. The violation of Irish sovereignty is the spectre which makes the presence of the gun in Irish politics inevitable and no amount of revisionist wishful thinking can alter this fact. And this is the challenge which republicans today must surmount if we are to say we stand in the shoes of Tone. How can our message achieve a political clarity which allows it to rise above the din of confusion and revisionism? 2016 will be a watershed for Irish republicanism. Whether this is a positive or negative event will be up to republicans to determine. Marching down to the GPO as anti-revisionists or anti-capitalists will only see us marginalised as a reactionary and unimaginative political movement. What we stand for must rise above the slogan; it must rise above the histrionics and it must cease to see self imposed isolation as a noble position to take. As republicans our arguments belong amongst the people because they are for the people. For too long the rich veins in republican thinking have been used by republicans as points of diversity and conflict between us. Instead of portraying Irish republicanism as politically profuse, relevant to all, we have narrowed it down to academic differences, relevant to none. This has to end. The time between now and 2016 affords us an unprecedented opportunity to achieve this. The Proclamation itself is the product of republican unity in its time, where is the logic in seeking to honour this immense document with disunity in our time? Our message to the Irish people on that august occasion must be one of clarity on how the armed conflict can be finally resolved and what the potential of a sovereign, independent Ireland can deliver for the well being of the Irish people. Partition continues to be an illegal violation of Irish sovereignty. It also continues to be the greatest calamity inflicted upon the wellbeing of all the people of Ireland. Partition has failed. Using partition to end partition has failed. Attempting to normalise the violation of our national sovereignty has also failed. We see these failures daily. We see it in a sectarian polarised Six Counties. We see it in an economically and politically compromised Twenty Six Counties. We see it in the continued abuses of political prisoners by both the courts and the penal system. We see it in the confused and almost farcical deliberations at Stormont and in the impotent Hass Talks, who fumble in the dark trying to convince us that they are trying to resolve problems they already assured us where resolved by the Good Friday Agreement. I would like to appeal to our fellow Irish citizens in the unionist community. As Wolfe Tone rightly observed, your future lies with the rest of your fellow countrymen in a sovereign Ireland where your identity is truly respected and your community commands genuine political influence on the nation’s ethos and future direction. The Flags issue is neither about rights nor identity, it is about fear and mistrust. And it goes to the heart of the problem wherein unionism pledges loyalty to an entity it will never trust. And with good cause. Perfidious Albion has victimised unionists as much as they have nationalists for their own selfish ends. There has been too much repeating of history in Ireland and it has always been to the detriment of the people of Ireland. The Westminster Parliament has only loyalty to its own self-interest; the delusion of Empire and world influence on the backs of subjugated peoples ensconced in their own puppet parliaments. As part of this insidious process we also see desperate efforts to re-habilitate John Redmond and Home Rule. Former Free State rulers like the obscenely paid John Bruton have been rolled out to lend an air of authority to the deeply flawed arguments that Redmond was a pacifist and Home Rule was the route to freedom. Redmond urged more men to their slaughter than the combined toll of physical force republicanism in history to kill and die for a form of colonial government which was reneged on by the very Parliament whose army those Irishmen killed and died for. It ranks as one of the greatest betrayals in history similar to the financial betrayal which John Bruton and his ilk inflicted on the Irish people. But do not be fooled that the Home Rule ethos is confined to history. It is not. It is alive and well in Stormont as a micro Parliament of Westminster and in Leinster House as a micro Parliament of Brussels. Sinn Fein has abandoned separatism, republicanism and socialism. It is now firmly rooted in partitionist politics with its snout foraging in the very same trough which feeds the lucrative pensions of those they wish to emulate. The route to social justice is through revolutionary socialist actions within and on behalf of our communities. We need to harmonise our social objectives with our national objectives as opposed to making one a precondition for the other. Radical new thinking is required on issues like drug abuse, rampant anti-social behaviour, the relationship between citizen rights and citizen responsibilities, housing and the communitie’s position within the body politic. The recent elections in the Six Counties have demonstrated a core support exists for points of view outside of the establishment. Equally the issue of Orange Marches have also shown that nationalist community influence is not the preserve of the largest electoral nationalist party. We as republicans of today can translate Wolfe Tones message of uniting Protestant, Catholic and Dissenter into uniting revolutionary republicans, radicalised communities and all the people of Ireland. The restoration of national sovereignty is the key, the evolution of the socialist republic will be the result.